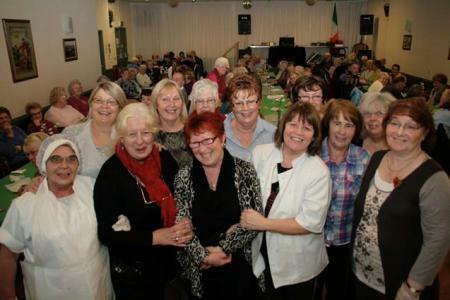 Milton Keynes Irish Welfare Support Group began in 2006 as a monthly drop in for the elderly Irish in the community. In 2007 we started the weekly lunch club which has grown beyond our wildest dreams.The group consists of mainly volunteers/trustees who now provide a range of facilities for the over 65's. We currently have 230 members and became a registered charity in 2009. Our aim is to ease the social isolation of the over 65's through social interaction.The Welfare Group provides recreational facilities in the interests of social welfare including the provision of a weekly lunch club for this age group, many of whom are vulnerable and socially excluded within the local community. We provide a keep fit session at the lunch club and the services of a Welfare Officer. All activities are open to everyone in the local community. Our lunch club is now the largest in Milton Keynes. We provide a hot meal every Wednesday which includes a juice/sherry, lunch, pudding, tea/coffee & biscuits. Current cost is £3.50. Average attendance is 70 per week, and the average age of our members is 75. They run their own weekly raffle and bingo.They also hold regular tombolas and book sales, 50% of the profits from these events are donated to our nominated charity, which this year is Willen Hospice the other 50% is reinvested back into the Welfare group and goes towards trips and social events for our members. All these activities make them feel they are valued and useful members of the community. For many of our elderly members the lunch club is their only hot meal of the week and their only social acitivity. Having a part-time Welfare Officer has been of enormous benefit as she has been able to assist with claiming benefits, health and well-being issues, form filling and generally offer a listening ear. As with all elderly people, whatever nationality, they are all very proud people. If you would like to make a donation to our Welfare Group through 'Local Giving' please click the donate button in top right corner of this page, or go to our 'Local Giving' Page.